Crew on Lowestoft RNLI’s all-weather lifeboat in the new Helly Hansen kit. 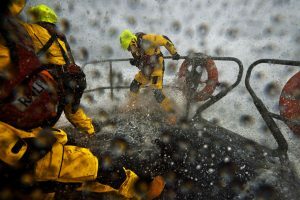 Helly Hansen, the global technical sailing brand founded in Norway in 1877, has committed to supporting the RNLI for the next five years through a variety of life-saving activities. These include delivering drowning prevention messages to their customers, generating income, supporting fundraising and safety campaigns, product innovation and supplying the very best kit to the RNLI’s lifesavers. Combining almost 350 years of rich heritage, innovation and expertise at sea, the RNLI and Helly Hansen share core brand values, history and experience – making this the perfect partnership for both organisations. Supplying the RNLI with new all-weather lifeboat crew kit, Helly Hansen has worked with the lifesaving charity to ensure the professional grade gear will meet the demanding needs of the RNLI’s volunteer lifeboat crews. The new clothing is due to go on service from September 2018. RNLI Chief Executive Paul Boissier said, “We are delighted to announce this partnership with Helly Hansen, a highly respected and trusted global technical apparel brand. Through this new alliance, we’ll be able to reach even more people with our vital safety messages, with Helly Hansen committed to helping us achieve our ambition of reducing drowning. 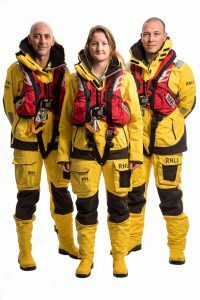 “Helly Hansen will provide our lifesavers with the very best kit to wear when they’re saving lives at sea. Our new all-weather lifeboat kit is due to start going on service from September and our beach lifeguards will receive their new kit next year. Paul Stoneham, Chief Executive Officer, Helly Hansen, said, “As a brand that defines itself through its work with professionals for over 140 years, Helly Hansen has a tremendous amount of respect for the RNLI’s mission, heritage and the individuals that have built and continue to sustain this critical institution. New Helly Hansen kit on three crew members. Designed to allow greater freedom of movement, the new all-weather lifeboat kit provides better endurance levels and comfort for the charity’s crew members. Waterproof, breathable and considerably lighter than the kit it will replace, the technical layering system will ensure crew members will keep warm and dry when they’re out saving lives in all conditions. The kit comes in a wide range of sizes, with versions tailored to fit male and female crew members. Alice Higgins, volunteer at Weymouth Lifeboat Station, was one of 60 crew members from six lifeboat stations across the UK and the Republic of Ireland who trialled the new Helly Hansen gear. She said, “The new all-weather lifeboat kit is absolutely fantastic. It’s much lighter than the old kit and uses breathable fabric, which is ideal for the more demanding tasks we often need to carry out. While trialling the kit it was great to find out that it kept you both warm and dry, even while out at sea in some harsh conditions. The new kit will be rolled out to all RNLI stations with an all-weather lifeboat, as well as two stations on the Thames (Tower and Chiswick lifeboat stations). The new lifesaving gear was judged to better meet the unique challenges crew at these stations face. As well as the new all-weather lifeboat crew gear and the lifeguard kit, Helly Hansen will also supply corporate clothing and uniforms for RNLI staff.